Perpetual twilight cloaked the forest on the darkest day of the year. Even at noon, fog hung densely between us and the sun. Cabin fever had set in, and we felt like banging our heads against a wall. Trying to make the best of it, we layered up and ventured out onto the Superior Hiking Trail. The elegant forms of birch, aspen, oak, and balsam fir near the trail stood out against a plain background. Beyond them, only the gray mist met our eyes. Nothing moved in the oppressive dampness, save us and the assortment of snow, sleet, and rain drops that pelted the world. Then a bird swooped through the edge of our vision, and a tapping sound punctuated the constant hiss of sleet. High on the trunk of a dying birch, a black-and-white-checkered woodpecker foraged in the bark crevices. His feathers blended perfectly with the white bark and black gnarls. A substantial, chisel-like beak – as long as the profile of his head – was evidently the perfect tool for prying and pecking bark beetle larvae from out of the punky wood. While leaning back for a better look, or perhaps winding up for a swing at the tree, his stiff tail provided a kickstand for support. The small patch of red feathers on the back of his head was a welcome bit of color in the gray woods, and it also informed me of his proper pronoun. We didn’t stop to watch this male hairy woodpecker, but I did mull over the state of his head as we hiked on. He’s obviously quite well adapted for his lifestyle, but how can that little bird bang his head against trees all day and not develop debilitating headaches? Scientists have been studying this problem for years, and for good reason. If we could figure out how to engineer anti-shock mechanisms into rapid collisions so that they were less damaging, it would revolutionize the world of transportation safety. In the case of the woodpecker, scientists in China used CT scans and computer models to discover that the impact energy is converted to strain energy, and 99.7% of the strain energy is dissipated throughout the woodpecker’s body. The 0.3% of the strain energy that affects the head is converted to heat energy. This could cause the woodpecker’s brain to overheat and result in a different kind of damage, which is why woodpeckers take frequent breaks while they are pecking. It isn’t just about perfecting a rhythm or grabbing a bug, they are protecting their brain. My psyche could use similar protection from the strain brought on by soupy weather and cabin fever! Instead of taking out our frustration by punching the walls, we hiked faster into the sleet. As the strain dissipated as heat, our red cheeks brought a little more cheer into the fog. It will only get brighter from here. Happy Solstice! The pile of sweaty skiing and outdoor clothes in my closet had begun to smell a little rank, as polypro is inclined to do. So I hoisted the laundry basket and schlepped it down two flights of stairs. In the corner of the last step, something small and dark, about the size of a nickel, caught my eye. “Thunk” went the laundry as I crouched down to get a better look. Sure enough, a brown spider crouched among the dust bunnies and dog hairs. Now, I know that this type of discovery elicits a wide variety of responses in people, and the majority probably lean toward some combo of screaming and smashing. But I’m at the other end of the spectrum. It’s been hard to “see” nature lately, since I spend most daylight hours in the office. As a result, I’ve been feeling a little deprived of my usual encounters with wildlife, so I felt honored to have some nature living in my stairwell. I ran up the steps, grabbed my camera, and did a little wildlife photography there on the basement steps. Long, hairy, rusty brown legs were banded with darker stripes. Her oval-shaped abdomen was tan, with a squiggly black chevron pattern and more hair. Long, slender pedipalps (also hairy), stood ready on either side of her mouth to taste, smell, and or help crush her food. Indeed, it was the delicacy of the pedipalps that identified her as a female – a male would have big club-like pedipalps to aid in reproduction. A quick search through Larry Weber’s Spiders of the Northwoods just got me more confused on the identity of the little critter. Show me some tree buds and I’ll point out minute differences that indicate this twig is (obviously) from a beaked hazel and the other one is from an American hazel. Show me a spider, and I say, well, it has long legs and dark stripes. That describes at least a third of the spiders in my guide. For help, I went straight to the source and emailed the photo to Larry. With enthusiasm, he identified is as “a type of Funnel-web Spider (Funnel-weaver); family Agelenidae. She appears to be the genus Tegenaria.” Then—as with any new roommate—I Googled her to find out more. According to Wikipedia (a good place to start, but not the final word), “house spiders of the genus Tegenaria are fast-running brownish funnel-web weavers that occupy much of the Northern Hemisphere except for Japan and Indonesia.” In northwestern Europe, where giant house spiders (Tegenaria duellica) are native, the British affectionately call them “dust bunny spiders,” due to their propensity to set up a territory under furniture. Long ago, these spiders might also have chosen to set up territories on the ships carrying the first European settlers in the 1600s, and/or in shipments of British lumber during the Napoleonic Wars (early 1800s), thus spreading from Europe to America. Their close association with humans may have earned them passage elsewhere, too, and they are now suspected to live in almost every country on Earth. You have to be fast to colonize the world, and giant house spiders held the held the Guinness Book of World Records for top spider speed (1.18 mph) until 1987. The “spiders” that beat their record are not even true spiders! Hmph! Happily, most of these house spiders would rather try to escape than try to bite you or your pet, so they pose little danger as roommates. David Sedaris, bestselling humorist and author, once befriended a number of Tegenaria spiders and noted that they are “as quiet and unobtrusive as Amish farmers.” One thing I did worry about was where this spider was living. Oh, I don’t care if it sets up shop in the basement stairwell—that wasn’t the problem. But everything I read suggested that these Funnel-web spiders should be living on a flat, sheet-like web with a tubular retreat at one corner. Nowhere at the bottom of the stairs could I find such a web. 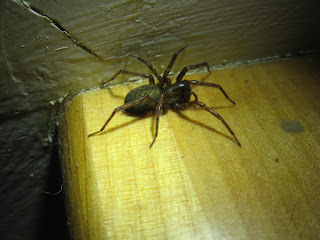 So I ventured into the basement itself to see if I could find the spider’s true home. I found the nooks and crannies surprisingly clear of webs, until I reached the farthest back corner. There, above the phone and internet boxes, hung a beautiful gossamer sheet web. Tentative jiggling it, I was surprised by a tiny black spider that suddenly bungee—jumped into the abyss and then lowered himself (male spiders are smaller) smoothly on a line of silk. A second black spider still clung to the web. As I looked even closer, I noticed several pale, leggy cellar spiders clinging upside down to messy, irregular webs like something out of Tim Burton's The Nightmare Before Christmas. The crumpled bodies of dead insects littered the floor under this spider colony. I took this as evidence that these spiders were contributing members of the household, not just some lazy freeloaders. Through all this adventure, my dirty clothes sat abandoned on the floor. If only spiders could add “doing laundry” to their list of helpful talents! Maybe you’ve seen them, too: flocks of brownish birds recklessly swarming on the sandy shoulders and even the traveled lanes of snowy roads. They don’t move until the last possible second, and sometimes that’s too late. At the Museum, we’ve been debating their identity. I’ve seen flocks of snow buntings lately, but those are black and white. Last week, Jayme Morey, Collections Assistant at the Museum, decided that the solution to our curiosity was to bring in one of the slowpokes off the side of the road to get a better look. With the help of Diane Kraemer, our other Collections Assistant, she identified the tiny, five-inch long corpse as a pine siskin, Spinus pinus. Despite their lack of even a four-year-old’s understanding of traffic safety, pine siskins have some amazing strategies for winter survival. And because they normally live in the remote forests of Canada, you can’t blame them for being naïve about cars. These little finches do have powerful engines, though. They can survive negative 94 degree Fahrenheit nights by revving up their metabolic rate to five times normal for several hours. That’s 40% higher than other “normal” songbirds. In order to fuel those internal fires, pine siskins put on 50% more winter fat than their cousins—common redpolls and American goldfinches. They also store a bedtime snack right in their esophagus—in the expandable section called the “crop.” But it isn’t just a single cookie and glass of milk; their crop can store seeds equal to 10% of their body mass. Those calories could get them through five or six hours of sub-zero temperatures. Having enough fuel to fill their crops and fuel their engines is the key to survival for pine siskins. That is what brought them south, to Northern Wisconsin. In the face of winter and diminished food supplies, every animal must choose between three basic survival strategies: hibernate, migrate, or stay active. Pine siskins have adapted to migrate, but not in the regular, biannual travels between particular places like common loons. Pine siskins “irrupt” in irregular migrations every couple years to wherever the food supply is greatest. When their typical winter food supplies in Canada are low, pine siskins may flock into New England, the upper Midwest, or even the southeastern United States. They are looking for plentiful supplies of seeds from pines, cedars, larch, hemlock, spruce, alder, birch, and maple. This year, I’ve seen lots of hemlock cone scales littering the snow. This tells me that there’s a good crop of hemlock cones, and that many critters are taking advantage of the bounty. Just as the boom and bust cycles of acorns kept passenger pigeons on the move and allowed some oaks to sprout, the cycles of conifer seed scarcity in Canada may disperse siskins and reduce the birds’ long-term impact on the plants. Pine siskins’ irruptive behavior also brings a diversion from our regular winter birds. With a touch of yellow on their wings, pine siskins look a bit like goldfinches, but they are heavily streaked on their head and body, while goldfinches have smoother colors. At your feeders, pine siskins prefer smaller seeds without tough shells, like thistle and oil sunflower. Be sure to watch for sick birds at your feeders. The high concentrations of birds in an irruption year can help spread Salmonella bacteria. Sick birds will look thin, fluffed up, and often have swollen eyelids. If you see this, clean your feeders thoroughly (with care to protect yourself) and take them down for a week to allow large flocks with sick birds to disperse. In the woods, listen for siskins’ wheezy contact calls, and look for their undulating flight. Flocks will often feed gregariously, and then swoop off one-by-one to the next tree. It can be hard to get a good look while they are flitting about in the tippy top of trees, in the high branches where cones are most plentiful. Still, you can admire their acrobatics as they cling upside down to bouncing branch tips. On the road, watch out! Pine siskins are fond of minerals like road salt. So, the next time you tap your brakes for a flock of brownish birds recklessly swarming on the traveled lanes of an snowy road, at least you’ll know what you’re dodging, and perhaps give a little more credit (and space) to your fellow winter travelers. Temperatures plummeted beneath a black dome of sparking stars. As the eight inches of ice already on the lake thickened and expanded in the cold, it sang the eerie notes of winter. A couple weeks ago the ice-notes were high and squeaky – shorter frequencies due to thinner ice – but tonight they deepened into the lower moans of thick ice. The ice’s plaintive wails brought to mind the lake songs of summer – as performed by loons. All summer long we alternately curse and acclaim their calls. One grumpy (and tired) visitor asked me “Do loons ever sleep?” after nearby birds had caterwauled into the wee hours of the morning. Although they do sleep, it’s not on our schedule. Since loons are visual hunters, they must feed when sunlight penetrates into fish habitat. When darkness brings relative quiet to the woods, they use that opportunity to communicate with neighbors. “Who’s there? I’m here,” may be the basic message in their wail. By speaking up, each loon reasserts that it is on its territory, and ready to defend against invaders. If a loon remains quiet, that could signal that its territory is free for the taking, a risky message to convey. As male loons patrol their territory boundaries each night, encountering a another male intruder will trigger a yodeling contest. That’s the maniacal cry, called “the laugh of the deeply insane” by writer John McPhee, that you curse might at 3:00 a.m. It may or may not result in a physical battle. Where are the loons now, though? I haven’t heard them calling since late summer, or seen an adult in quite a while. The last loon I saw was the sole surviving juvenile from a nest in a nearby bay. With any luck, he was able to gain enough strength to migrate south by November 14, when the lake started to freeze. There’s no way of knowing where my particular unmarked loon neighbor went, but the United States Geological Survey (USGS) has captured and radiomarked several juvenile loons on lakes scattered across Minnesota and Wisconsin. Researchers use geolocators and satellite transmitters to track the movements of migrating and wintering loons. From their data, we can watch the juvenile loons move south in almost real-time, on animated maps. As with most years, the 2014 juveniles began their journeys from late October to mid-November. It looks like a few loons headed south just ahead of ice-up! Their routes aren’t identical, but some juvenile loons made a layover on Lake Michigan. Others made pit stops on the Mississippi River or reservoirs in the central states. The juveniles must make the trip alone, since their parents and non-breeding adults migrate earlier. In general, non-breeding adults start migration in late August, mothers leave in September, and fathers head out in October. After making the big journey and coping with salt, loons gain access to a seafood feast. Wintering loons eat flounder, crabs, lobster, shrimp, gulf menhaden, bay anchovies, silversides, and more. The ocean bounty gives loons enough energy to molt and regrow all of their feathers, but danger is still present. Not much is known about loon predation in the ocean, but I’ve heard that dog sharks will race upward through the water to attack loons from below. Unfortunately for human snowbirds, the loons’ winter feast doesn’t happen within viewing distance. Most loons spend the winter at least five miles (and often much farther) offshore. Even if you could see the loons, you might not recognize them. The adults and juveniles all wear drab brown plumage, and sport dark eyes instead of the ruby red eyes of breeding season. They aren’t known to vocalize. In the spring, adults molt back into breeding plumage, complete with red eye. Juveniles stay brown and ocean-bound while they mature, and will only migrate back toward their natal lake after they are three to four years old.